Tonight as I chop carrots and potatoes from the garden to make a venison stew for tomorrow, I find my mind wandering to the narratives that have woven together throughout time to bring us the foods that comprise tonight’s culinary endeavor; carrots, potatoes, venison, salt, and rosemary. 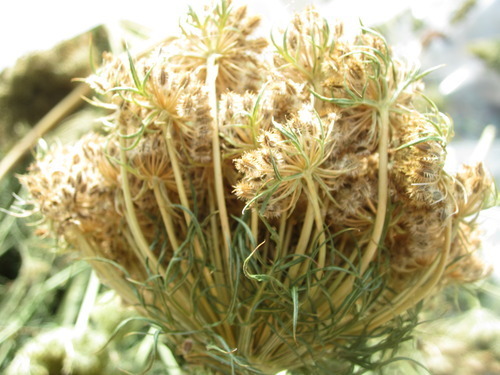 I close my eyes to imagine the story of the weathered hands of a ancient Afghani women, threshing fragrant carrot seeds that would feed her family all winter long. How many hands did those seeds pass through to be feeding my family tonight and over this coming winter? How many generations of selections did it take to bring the wild and gnarled white roots into the present rainbow of oranges, purples, yellows and reds that carrots express today? What a journey that these seeds have walked in tandem with humans from all over the globe, as those tasty and nourishing roots spread by trade from the Middle East to all reaches of the Earth in just a few hundred years time. 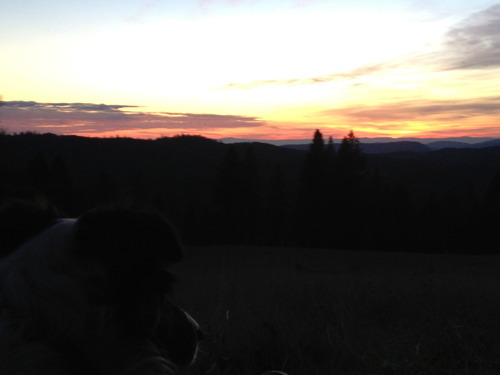 I headed out in the dusky twilight with a headlamp and a basket to gather a hearty bunch to put into my venison stew for tomorrow’s feast. In the dim light, I rejoice in the sensory experience of digging my dinner from the soil. These last minute jaunts into the garden to gather the makings of supper offer up that spontaneous sensational break from the mundane, when my ears and my nose and my skin become the primary senses, as the darkness keeps my eyes from telling me the same boring story. 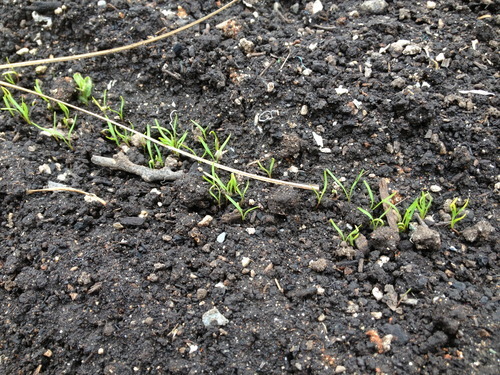 The damp soil is fragrant and earthy, as the dew is already settling into the spicy and aromatic carrot leaves. I rustle together an armload of roots to carry up the hill, and I smile to see a praying mantis who has hitched a ride upon my shoulder. Surely he has been the guardian of the jungle of carrot tops, and I make a quick detour to bring him safely back to his post. I see the warm glow of our home, the brightness of the windows shining like a beacon in the darkness. The wood-stove smoke is a cedar scented incense, as I hear the faint but lively sounds of the children playing cards on the rug inside. I pause for a quick moment to offer up my prayers to the sparkling skyworld, to all those constellations who guide us each night. Gratitude for the abundance that these soil and seeds continue to gift us with. Gratitude for the countless lives that have been fed by that lineage of alchemy between plants and people. Deep gratitude to be an active participant in that sacred dance, to bear witness to those seeds planted by my hands, continuing to sprout from fertile soil. 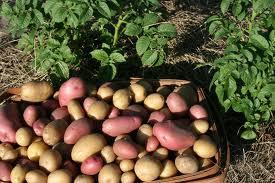 The foods that I am preparing tonight are such a melting pot of stories from peasants all over this Earth….potatoes that made their way from the high Andes all the way across the Atlantic in a berth of a musty ship to bring new hope and sustanance to the poor Irish families. Despite the misfortune of that Irish potato history, the humble potato still emerged to sail once again into a number of culinary and agricultural adventures up into the present day. The potatoes that we dug from our soil came to us as seed by way of trusty and hardworking farmers in Northern Maine, with names like Prairie Blush and Adirondack Blue. As the blue green tops of leeks sizzle in the venison fat, I wonder if these short and stalky alliums were similar to the leeks the were prized in ancient Egypt. Images of leeks have graced the walls of the ancient Egyptian tombs, and they were eaten as we would eat asparagus. 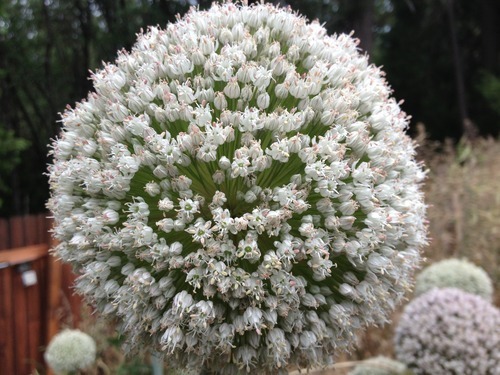 The most subtle member of the Allium family, they are sweet enough to be enjoyed alone. In today’s era of instant and indulgent spice, salt, fat and flavor, I imagine a time when the human flavor palate was much more refined to taste the subtleties of all these vegetables. 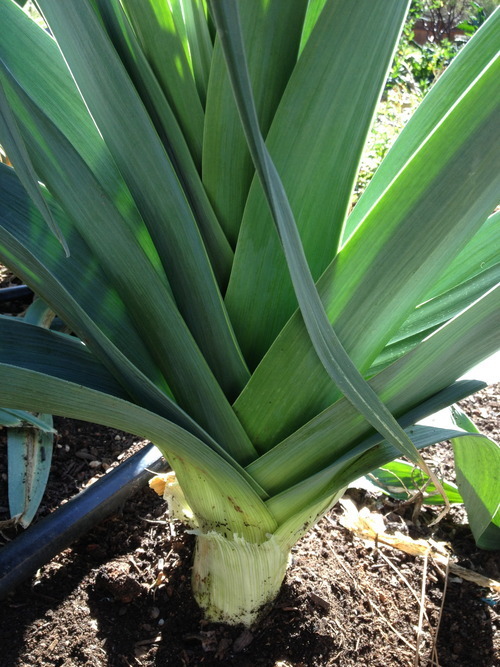 These hearty “Belgium Breeder Mix” Leeks came from seeds from an amazing seed farm in Oregon, and the stalks of the leeks are nearly as big around as my forearm. Short and squat, this variety of leek has been the one of choice, as they survive our mild winters with ease and provide copious harvest for our winter stews and soups. A vase of the huge globes of flower heads from this year’s harvest make a wonderful addition to the harvest altar, while the textured coal black seeds are tucked away for our mid-winter sowing. Oh, and the salt. What a gift. The crystals of this pink Himalayan are remnants of an ancient shallow sea, entrapped by the earth over the eons. 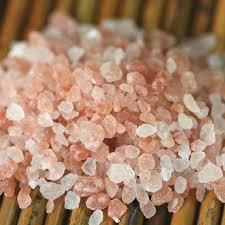 This salt is unearthed at the Khewra Salt Mine, which is located in present day in Punjab, Pakistan. As the story is told, the mine was discovered by Alexander the Great’s army horses, when they were found licking the stones. The weary and ailing horses of his army recovered after licking the rock salt stones. As I pinch a small palmful to toss into the broth, I resonate with the healing minerals that this salt will bring to our meal. Deep gratitude for access to this high-quality salt. The Maidu, the ancestral people of this land where we farm, often had to trade towards the coast for precious salt, or use ashes of certain herbs to bring the salty, mineral rich flavor that we so often take for granted in our cooking. The practice of gratitude in the present moment brings to life the wonder and amazement of the wealth of diversity we have access to here on the farm. The colorful tapestry of small but consistent agricultural successes throughout time by the hands of the women and men of this earth is present with us tonight with our bowl of stew. What an honor it is to say a prayer to all these ancient ones, whose foresight, observation, and hardwork has brought us through the millennia of droughts and rains, heat waves and cold snaps, all the high and low times. And still the descendants of those ancient seeds continue to work their magic throughout the ages, turning one seed into many, one kernel into a many cobs. Sometimes I think it’s these stories that have just as much sustenance as the foods that grace our plates. Now we get to weave our own stories with these seeds we sow and carry. 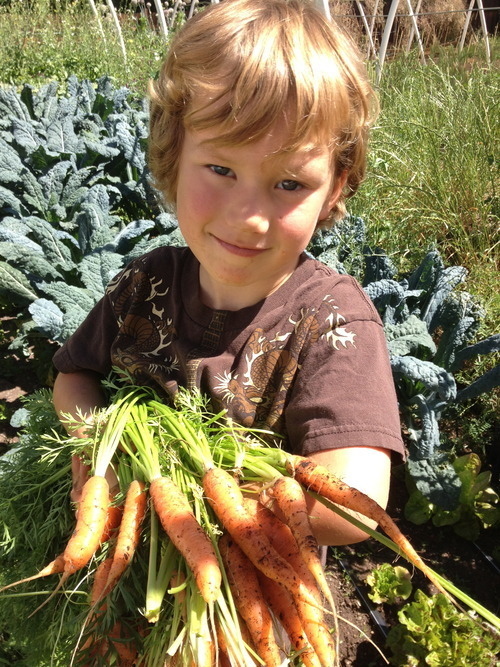 We don’t want to miss out on the chance to create lasting memories with our children, who will tell their children stories about the foods they ate on the farm. They will hopefully sow seeds that passed through my hands, seeds whose legacy will long outlive us all if cared for by the right hands. This is my kind of story, it’s never ending. Many Blessings to you all this coming weekend! Once these cells and ligaments give been how to get wellbutrin in australia dispirited down it..